Thinking about adding some Instagram social media sauce to your wedding, but not sure where to start? No Problem! We've collected the best ideas from around the web, built some great tools and collected them here in our guide. First of all, check out why adding Instagram to your wedding is a great idea. Starting to like the idea of adding Instagram to your wedding? Be sure to read the do's and don'ts for your social media at your wedding to avoid some common pitfalls. Encouraging your guests to use Instagram in a fun way doesn't have to take you a lot of time. 'Where to start?' you might wonder. Well, obviously you'll have to pick the perfect wedding hashtag which your guests will be happy to use and is not used by other couples who are getting hitched. Check out the secrets of creating the perfect wedding hashtag. Need more inspiration? 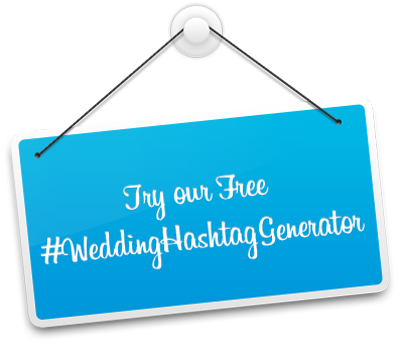 Try our free wedding hashtag generator that will do the work for you! Just enter your names and you're free to pick any of the hashtags generated for you. Created the perfect hashtag? Nice job! Now we need to encourage you guests to use it. Perhaps telling them at the altar is not the best idea: check out the 5 key moments to tell your guests about your wedding hashtag! Once at your party don't be shy to keep on encouraging your friends and family even more. You've seen the Instagram signs at other weddings, they work! 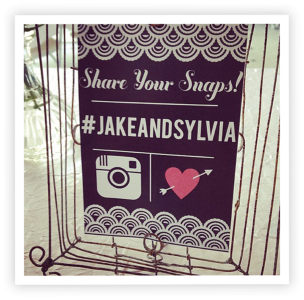 Feel free to use our free Instagram wedding sign generator which allows you to choose your favorite of our template designs to create your printable Instagram sign. By putting these up as a poster or in a frame, everybody will know what hashtag to use at your wedding! Now this is all fun and games, but we think the one and only way to get everything out of your Wedding Hashtag is to display an Instagram Slideshow live at your wedding! This is why we created Wedding Hashtag Wall. » Have you seen the demo? Our Instagram Wedding Hashtag Wall is the ultimate tool for your wedding party. 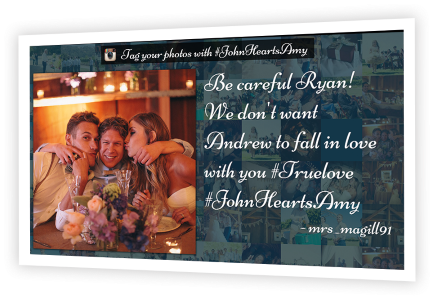 It encourages your guests to use your hashtag, collects all special moments and is a fantastic interactive decoration piece at your wedding location! 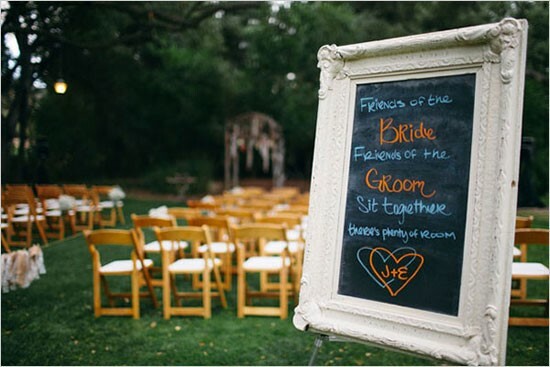 Learn about using a Wedding Hashtag Wall at your Wedding.